By robbie ward (staff writer) A Paupack Twp. man who met his German doppelganger earlier this year is receiving help from a genetic testing company to see just how nearly identical the two men are. While looking through his family records overseas, 64-year-old Richard Krebs found the brother he said he never knew he had - even if they may not actually be kin. Finding his new family started with his plans to give his newborn grandchild a family history as a gift. The search took a peculiar twist late one night, during a frustrated moment when research seemed to hit roadblocks. 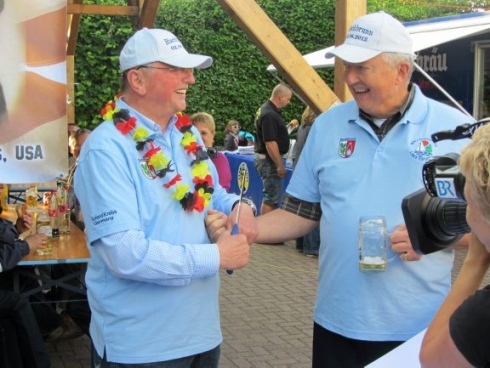 Mr. Krebs stumbled on the website of Richard Krebs, the mayor of Bischbrunn, a community of about 2,000 in the German state of Bavaria. But they shared more than just a name. They were the same age, and the two men had striking physical similarities during many periods in their lives. Mr. Krebs contacted his German doppelganger, and the online relationship between the two led the German to invite his Pennsylvania counterpart for a visit in June. The American Mr. Krebs' father and uncle emigrated from Germany in the 1900s. Mr. Krebs and his wife returned to Paupack Twp. from Germany with the belief that family stretches much wider than bloodlines. And now, the next chapter is unfolding. After hearing about the unusual story, someone told Mr. Krebs about 23andMe, a DNA analysis company based in Mountain View, Calif., that tests people using advanced technology to determine relationships. "DNA can be quite revealing," said Cathleen Afarian, spokeswoman for 23andMe, which refers to the 23 chromosomes found in human cells. "Our technology helps people like them find their roots." With more than 150,000 customers since the company began the service in 2007, 23andMe offered a free test for the two Richard Krebses to determine if an actual genetic relationship exists. The German Mr. Krebs recently accepted the offer from 23andMe, which requires a saliva sample. Within a month, the two men will know if a genetic relationship exists. A retired engineer at Verizon Communications, Mr. Krebs of Pennsylvania still shakes his head in amazement at the chance encounter that has changed his life. He compares it to a science fiction movie or a fairy tale. "It's like Alice falling into a rabbit hole," he said. "I just don't know how it's going to end." During the two-week trip to Germany, the Pennsylvania Mr. Krebs and his wife experienced a welcome fit for a foreign dignitary. They entered Bischbrunn riding in a horse-drawn carriage, serenaded by a brass band, witnessed a poet reciting a piece for the occasion and saw banners displaying the two men's photos. Television and newspaper reporters covered many days of the Krebs' German trip, leading the husband and wife to wake each morning to read different accounts of their previous day. The area's hospitality endeared the Americans to the area. However, few things compared to the connection between the two families. "I felt like I'd always known him," Paupack's Mr. Krebs said. "It felt natural." 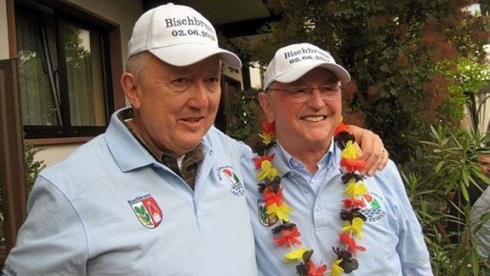 The two Mr. Krebses consider each other brothers, but the connection extended into their family during the trip. "His granddaughter climbed into my lap, held my hand and called me the German word for grandfather," Paupack's Mr. Krebs said. During the trip, he also visited many areas where his family once lived, tracing his family lineage. His doppelganger arranged for mayors of towns and communities to greet the Pennsylvania man, providing personal welcomes to each area. Even before the trip, the two men learned their families lived within 2½ miles of each other in 1748. Before the American Krebses returned to the United States, the Krebses of Germany accepted an invitation from their newfound family to visit Pennsylvania in April. However the test results come out, Paupack's Mr. Krebs said it won't affect their family standing with each other. "It doesn't matter how this turns out," he said. "He's still my family. He's still my little brother. I'm still his granddaughter's grandfather."